Although it's only October, NOW is the time to pick up your boxes for Operation Christmas Child! We picked up our FREE boxes at our local Family Christian Store. You can also use your own shoebox to participate. 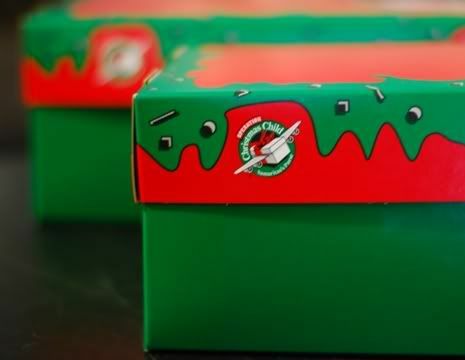 Just visit Operation Christmas Child's website to find out the details, as well as watch some video clips from last year's operation. National Collection week for the boxes is November 16-23, 2009. This was a fun way to get the boys involved in thinking about other children. It showed them how you can find joy and blessings in GIVING to others! Austin chose to make a box for a 2-4 year old boy and Noah chose to make one for a 5-9 year old boy. 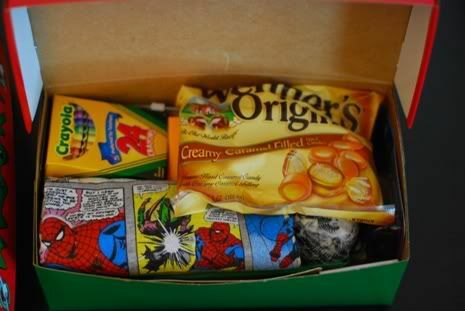 We included things like candy, small toys, shirt, pencils and sharpener, crayons, soap, toothbrush and toothpaste and a comb. To see how Samaritan's Purse uses this ministry to share the gospel, you can watch the videos HERE. Better yet, watch them with your kids! I bet they would love to get involved! Oh yes! This is an AWESOME ministry! We love Operation Christmas Child! Our church does shoe boxes every year. My kids love picking out the gifts for the boxes. It feels good to be helping someone else. The looks on those children's faces when they receive their boxes is priceless. What an awesome idea... I'll have to look for something like that in Canada. Hi, I've never commented here before. I always enjoy your posts. I ran across your blog through Jimmies Collage and have been hooked since! Operation Christmas Child-great idea. Awesome way to teach selflessness. Your photos are always so awesome. I'm in the starting adventure for finding a new camera since mine is on the blink. What camera do you use? Love it! I think we'll be doing this for the 1st time this year- excited to be involved in giving in His name! I came across your blog today and was happy to see your post. I have been looking for something like this to do with the kids. We gathered our shoe boxes today and are going to fill them this weekend. I found a church nearby where we can drop them off. Thanks for the info. We do something very similar to this for the children's programs at chursh. The kids really get into it and enjoy helping other kids!